I don’t follow the power metal scene all that closely so I don’t know much about Masterplan but I have been familiar with Jorn Lande thanks to his work with Tobias Sammet’s Avantasia projects and I’m aware he’s a pretty big deal in his own right amongst the progressive, melodica and power metal communities. He’s a truly gifted vocalist but I’ve never been enticed to try out any of his other projects just because I’m not a huge power metal fan. 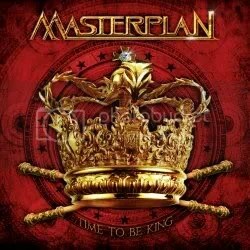 When the option to check out Masterplan’s Time To Be King came along, I first did a bit of research on the band and liked a few songs from their earlier releases so I figured I would give this a try. I’ve listened to this album more than a few times but to be honest I’m having trouble finding enough words for fill a review for it. There are very few power metal bands that impress me. While there are some really good moments on this album, ultimately, Masterplan is not amongst that elite group that makes an impact on me. It’s certainly a competent album filled with talented musicians and Jorn Lande proves his worth once again as one of metal’s best active vocalists but I can’t help shake the feeling that this music has no soul (this coming from a guy that LOVES hair metal!). Again, that’s just the way I feel about power metal in general so perhaps Masterplan never really had much of a chance with me in the first place and I’m not the best opinion to seek out. Is this “bad” music? No, but I don’t think anyone who isn’t already sold on melodic metal is going to be converted by this album.